Dedicate each roll out tray to one purpose. Above, the first roll out tray holds baking ingredients. The third roll out tray holds ingredients for from-scratch meals. 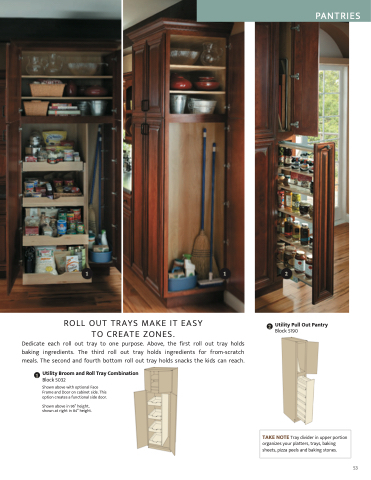 The second and fourth bottom roll out tray holds snacks the kids can reach. Shown above with optional Face Frame and Door on cabinet side. This option creates a functional side door. Shown above in 96” height, shown at right in 84” height. TAKE NOTE Tray divider in upper portion organizes your platters, trays, baking sheets, pizza peels and baking stones.